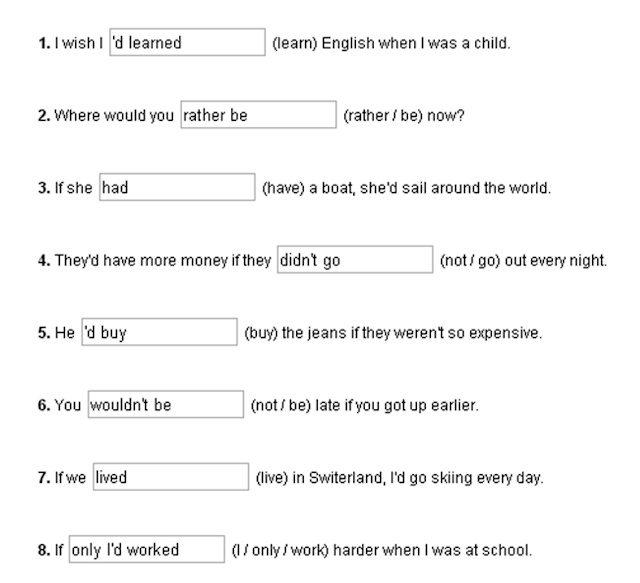 Select the verb form that completes the sentence. 1. It's raining. You don't like rain. I wish it (not-rain) didn't rain not to rain weren't raining . 2. It's raining. Your friend is leaving without his coat. I hope you (take) will take would take to take take your coat. him about the advice you gave. I wish you (wear) would have worn had worn could have worn wore your coat, but you wouldn't listen. 4. You wish to buy a new coat, but you have no money right now. I wish I (buy) buy bought could buy would buy a coat. 5. You weren't at the noon meeting. You had another appointment. I wish I (be) were was had been could have been at the noon meeting, but I had another appointment. 6. You are angry about a person failing to show up to a meeting. I wish you (call) would have called could have called had called me to let me know you couldn't meet me. 7. You want to help prepare some documents for a meeting. Make a request / wish. I (like) will like would like to like like to help prepare the documents for the next meeting. 8. You are at a party. You want to go home. Tell your friend. Make a direct request/wish. I (wish) will wish we wish we wish to would wish to leave now. 9. Your friend wants help with homework. You want to watch a TV movie. Make an excuse. I wish I (help) can help could help could have helped would have helped you with your homework, but I have something else planned at the moment. photocopied his behind. You missed it! I wish I (see) had seen could have seen saw that! were thinking at that time. I wished I (have) had had have had have a camera! 12. You have an office mate who smokes. You express a somewhat angry wish. I wish you (stop) will stop would stop would have stopped smoking! Complete the sentences. Use contractions where possible. I wish I (learn) English when I was a child. Where would you (rather / be) now? If she (have) a boat, she'd sail around the world. They'd have more money if they (not / go) out every night. He (buy) the jeans if they weren't so expensive. You (not / be) late if you got up earlier. If we (live) in Switerland, I'd go skiing every day. If (I / only / work) harder when I was at school.